Barn Swallows have adapted to nesting near people, and build their cup-shaped mud nests in barns or garages, or on protected ledges, often near each other. The good news? These twittery, flittery birds love to eat the insects that humans consider pesky. Imagine: 60 insects per hour, a whopping 850 per day. That's how much each bird eats. Has a Barn Swallow started slapping mud on a wall of your house in preparation for making a nest? Are you dreading the clean-up duties that will follow? If so, the chattering of this swallow probably is not music to your ears. 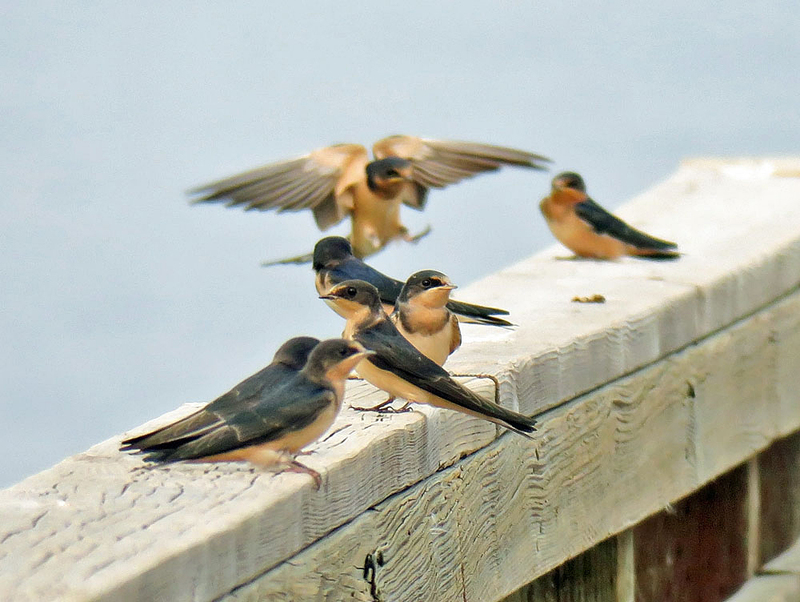 Over the years, Barn Swallows have adapted to nesting near people, and often build their mud nests in barns or garages, and on protected ledges. They seem to particularly favor ledges right above a front door. The welcome mat below becomes a pile of unwanted calling cards. But a Barn Swallow nest above the door is also a sign of good luck. How could that be? Simple. 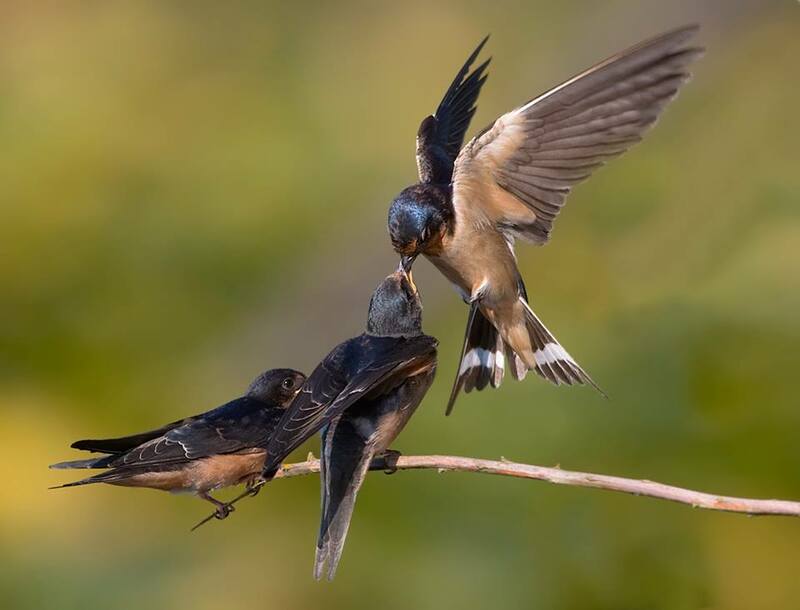 Barn Swallows love the insects that we humans consider pesky, [mosquito] especially mosquitoes, gnats, and flying termites. 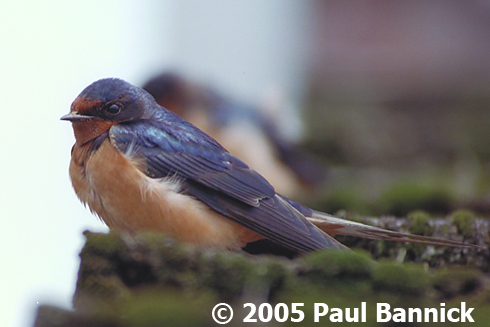 A single Barn Swallow can consume 60 insects per hour or a whopping 850 per day. That’s 25,000 fewer insects per month that might have joined your summer barbecue. Considering the hundreds of thousands of Barn Swallows all over the country, well… that’s roughly a buzzillion bugs that aren’t bothering us humans. Maybe now the chatter of the Barn Swallow is a more pleasing sound. For remarkable photos of the birds we feature, come to birdnote.org and click “Weekly Preview.” That’s birdnote.org. I’m Mary McCann. Bird sounds provided by The Macaulay Library at the Cornell Lab of Ornithology, Ithaca, New York. Recorded by R.S. Little. Ambient sound recorded by G. F. Budney.